Enjoy the outdoors with a retractable awning. Designed to provide years of maximum sun protection for your windows, patio or lounging areas. Retractable awnings give you the freedom to choose when you want to enjoy the sun. Stays on your home or business all year long. Available in both motorized options and manual crank. Commercial: Looking for a way to cover your customers from the elements but still want to enjoy the sunshine? Then a commercial retractable awning is the answer. Offered in a wide variety of colors and patterns to match your storefront. Even add your company name or logo for recognition. 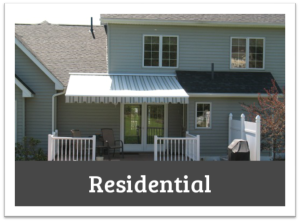 Residential: Retractable awnings give you the flexibility of when you want sun or shade. Put the control in your hands with motorized options or let your mind be at ease with wind sensors. Offered in a wide variety of colors and patterns to fit your taste. Jamestown Awning and Party Tents offers Retractable Awnings in Jamestown, Lakewood, Mayville, Westfield, Chautauqua, Ripley, Bemus Point, Findley Lake, Warren, Dunkirk, Fredonia, Bradford, Salamanca, Alleghany, Olean and many other areas throughout Western New York and Northern Pennsylvania. 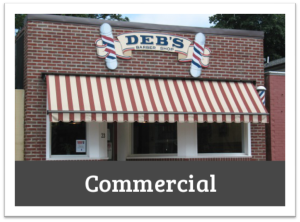 We have created thousands of awnings since 1964. There is no job too big or too small!